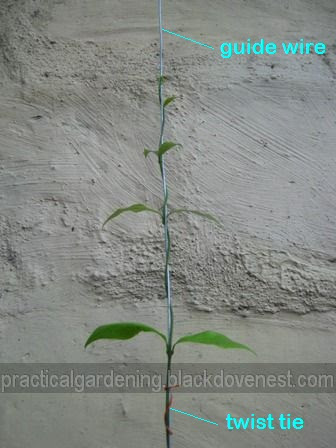 In addition to the bamboo stake that props up the young Sandpaper vine, I tied a guide wire on the top end of the bamboo stake and attached it to the vine structure or trellis above it. The guide wire, which is really a trellis starter, is a dual purpose device. First, it allows the new shoot of the vine to climb it. And second, it correctly guides the Sandpaper vine towards the vine structure or trellis above it. Below is a photo of the vine four months after it was planted. The vine is around five feet high at this point. You can see the vertically straight guide wire where the vine is climbing. To keep the vine straight, I use pieces of twist ties or thin wires. These twist ties loosely wrap the vine to the guide wire, thus keeping it close to the guide wire as possible. To minimize slack in the vine, I added more of the twist ties along the guide wire. You need to check the vine's growth occasionally because the vine may undergo sudden growth spurts. This means, slack may form in other parts of the vine and twist ties need to be added or re-positioned. Or the trunk may become bigger and thicker that you may have to remove the twist ties. After three more months, the trunk of the Sandpaper vine has become thick at the base. The trunk's bends have been corrected significantly. Because the splints are still constrictive, I removed them to allow the natural growth and thickening of the trunk. Here is a photo of the Sandpaper vine with the splints removed. After four more months, the Sandpaper vine has grown robustly with thicker foliage and a bigger trunk. There are now more branches at the canopy of the vine. These branches are mostly supported by the vine structure or trellis that is attached to the wall. The vine is now ten feet high at the topmost leaves. Thus far, the trunk's growth has remained vertically straight and this is largely due to the guide wire. At this point, the guide wire is still attached to the bamboo stake below and is connected to the trellis above. Shown below is how the guide wire is hooked to a trellis wire on the vine support structure. In the photo below, notice how thick the Sandpaper vine has become. It is roughly as thick as my finger. The vine trunk is around 3/4" to 1" thick at the base. This is the main trunk still attached to the guide wire. After a week, I decided to remove the guide wire and twist ties still attached to the vine. I've observed signs of girdling that may further damage the vine. As I climbed up the ladder to reach the Sandpaper vine's canopy, I noticed that girdling has already set in. Notice one of the branches now severely constricted by a thin wire that was placed to guide it on the trellis. Fortunately, the other thin wires or twist ties have already been removed. Apparently, I missed this one because of the thick and heavy foliage that has developed.